At Sustain Dane’s Badger Bioneers Conference, we will explore the idea of human(ity) — the duality of celebrating our diversity while deepening our connection. Neighbors, students, educators, activists, professionals, and volunteers will unite for a full day. Together, we will build a movement for a happy, healthy future in our region and beyond. Join us for a transformative and uplifting day. 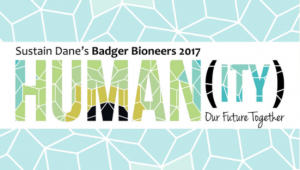 All are welcome at Sustain Dane’s 9th annual Badger Bioneers Conference on Wednesday, November 29 at the Gordon Dining & Events Center on the UW campus. Early bird is LIVE – register now for a discounted rate!